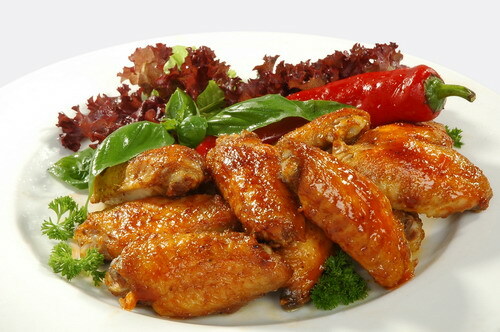 Chicken wings can be cooked extremely tasty, if you add soy sauce, honey and a little wine. A tangy and unusual taste will please you and your guests. 500 grams of chicken wings 3 tablespoons soy sauce, 1 tablespoon honey, 1 tablespoon honey, 1 tablespoon of dry white wine, vegetable oil, pepper. Preheat a frying pan vegetable oil and sauté chicken wings until Golden brown. Mix soy sauce with honey and wine until smooth. Stir about 2-3 minutes, until the honey is well dissolved. Pour the sauce into the pan with the wings and cook for 10 minutes over high heat. Flip the wings, drench them with sauce and pepper and cook for another 5 minutes. Serve chicken wings with rice or spaghetti.